In the beauty industry, local companies lose and the foreign companies win in nearly all places around the world. However, it is believed that in Islamic and traditional cultures, local companies have a competitive edge over foreign multinational companies, an edge that impacts consumer choices. What contributes to this edge combines the concepts of Warisan (traditional and cultural) and halal (an Islamic concept of purity and cleanliness) that are applied by local companies in Malaysia, Indonesia and Thailand to compete against multinational companies and win battles for profits. In the beauty industry, the literature lacks an explanation of why consumers choose certain beauty product brands and the reasons for their choices in Malaysia, Indonesia and Thailand. 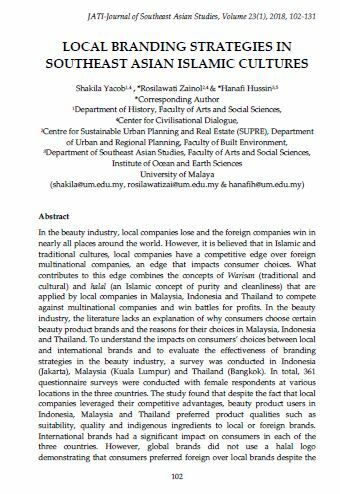 To understand the impacts on consumers’ choices between local and international brands and to evaluate the effectiveness of branding strategies in the beauty industry, a survey was conducted in Indonesia (Jakarta), Malaysia (Kuala Lumpur) and Thailand (Bangkok). In total, 361 questionnaire surveys were conducted with female respondents at various locations in the three countries. The study found that despite the fact that local companies leveraged their competitive advantages, beauty product users in Indonesia, Malaysia and Thailand preferred product qualities such as suitability, quality and indigenous ingredients to local or foreign brands. International brands had a significant impact on consumers in each of the three countries. However, global brands did not use a halal logo demonstrating that consumers preferred foreign over local brands despite the high level of awareness for halal products and ingredients (including indigenous herbs), that international brands did not offer. Indigenous branding strategies that emphasized halalness and indigenous knowledge of herbs were less impactful on brand choice. The quality, suitability, and ingredients took precedence over the halal factor. YACOB, Shakila; ZAINOL, Rosilawati; HUSSIN, Hanafi. LOCAL BRANDING STRATEGIES IN SOUTHEAST ASIAN ISLAMIC CULTURES. JATI - JOURNAL OF SOUTHEAST ASIAN STUDIES, [S.l. ], v. 23, n. 1, p. 102-131, june 2018. ISSN 2600-8653. Available at: <https://jati.um.edu.my/article/view/12189>. Date accessed: 20 apr. 2019. doi: https://doi.org/10.22452/jati.vol23no1.6.